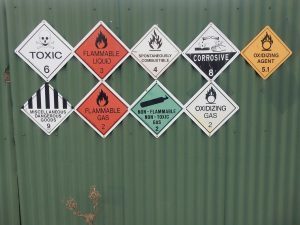 Retailers have long been aware that there are regulations to follow when transporting dangerous goods safely and securely. However, it may be surprising to learn what is actually classed as a dangerous product – for example, aerosols, perfume, food flavouring or any item containing lithium-ion batteries are deemed potentially hazardous. Essentially, a dangerous good is any product which, if handled incorrectly, could harm the sender, driver, recipient, other shipments or the environment. The sender is responsible for classifying, packaging and marking any dangerous goods for shipping and the goods are subject to inspection by various authorities depending on their method of transportation. The importance of ensuring your shipments are fully compliant with these rules was highlighted by Amazon’s £65,000 penalty for attempting to ship lithium-ion batteries and flammable aerosols by air. The prosecutor for the case warned that even new, undamaged batteries have the potential to overheat, potentially causing burns, explosion or a fire. It may sound a little daunting, but Hallmark are always on hand to simplify the shipping process for our clients with our expert knowledge of dangerous goods, which comprise of nine different classes. Hallmark can identify exactly which category your shipment falls under by submitting your product data sheets to our carriers who will advise if they will accept the products in their network and if there are any additional requirements we need to adhere to. Following this, we will guide you through the process of packing, labelling and transporting your products. By outsourcing to us, you can be safe in the knowledge that your products are being shipped in a secure and fully compliant way; in the most appropriate sustainable packaging and with the most suitable carrier assigned to handle them. To find out more about how we can help you to ship your goods safely, please contact us here or call the team on 01664 485000.